Our expert medical team analyzes worksites and job responsibilities to make workplaces safer and implement safety measures. Below are a list of services that our Safe Work Team provides. Establish a medical baseline for your employees in accordance with the appropriate regulatory agencies, such as DOT and OSHA (Occupational Health and Safety Administration). Make sure that your employees can perform the job duties unique to their positions by matching the physical demands of each job with the physical capabilities of each employee. Health surveillance tests help employers stay compliant with OSHA regulations for respiratory and HAZMAT employers. Tests include pulmonary function tests, chest x-rays, audiograms and blood tests. Our team helps employers create job descriptions based upon essential job functions, and then matches those functions to their physical requirements, creating a performance-measuring baseline compliant with the Americans with Disabilities Act. These job descriptions can be used as injury-prevention tools as well as a guide to assist in transitioning employees back to work following a work related injury. Want to learn how your organization can manage and reduce costs? 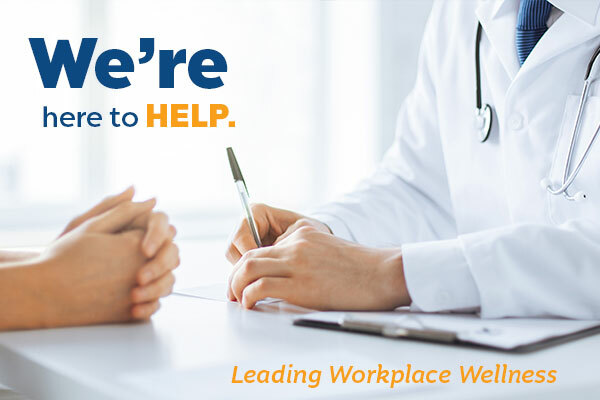 Let us show you how we can shift employee injuries and worker’s compensation case management from your HR team to ours, and free you to focus on running your business. When on-the-job injury does occur, our skilled team of physicians, physicians assistants, registered nurses, and physical & occupational therapists work together to provide injured employees with the treatment they need to heal and return to work as soon as possible. Our services are comprehensive, from diagnosis through rehabilitation. Additionally, our staff is experienced at working within the workers’ compensation system. Our Case Management System takes the frustration and confusion out of workers’ compensation claims. A registered nurse, specially assigned to your employee’s case, will continually communicate employees’ medical progress to you and your insurance carriers. Based upon your organization’s needs, Occupational Health develops and administers effective education programs on virtually any safety and wellness related topics.